182 pages | 2 B/W Illus. Crime in England, 1815-1880 provides a unique insight into views on crime and criminality and the operation of the criminal justice system in England from the early to the late nineteenth century. This book examines the perceived problem and causes of crime, views about offenders and the consequences of these views for the treatment of offenders in the criminal justice system. The book explores the perceived causes of criminality, as well as concerns about particular groups of offenders, such as the 'criminal classes' and the 'habitual offender', the female offender and the juvenile criminal. It also considers the development of policing, the systems of capital punishment and the transportation of offenders overseas, as well as the evolution of both local and convict prison systems. The discussion primarily investigates those who were drawn into the criminal justice system and the attitudes towards and mechanisms to address crime and offenders. 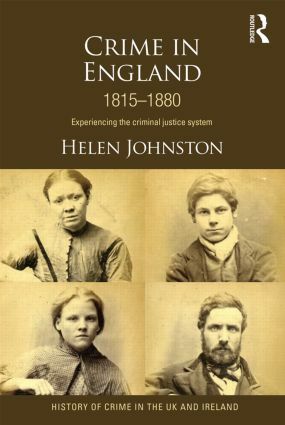 The book draws together original research by the author to locate these broader developments and provides detailed case studies illuminating the lives of those who experienced the criminal justice system and how these changes were experienced in provincial England. With an emphasis on the penal system and case studies on offenders' lives and on provincial criminal justice, this book will be useful to academics and students interested in criminal justice, history and penology, as well as being of interest to the general reader. Introduction 1. The Causes of Crime 2. The Criminal Classes and the Habitual Offender 3. Policing England, 1815-1880 4. Capital and corporal punishments: From public to private 5. Transportation: Convicts to the colonies 6. Local Prisons: Diversity, discipline, centralisation 7. Convict Prisons: Experiencing Penal Servitude 8. Women, Crime and Custody 9. Juvenile Offenders: Responding to the problem of juvenile crime 10. Concluding remarks. Helen Johnston is Senior Lecturer in Criminology at the University of Hull. Her research interests lie in the history of crime and punishment, particularly in the penal system and offenders lives during the nineteenth and early twentieth centuries. She is the editor of Punishment & Control in Historical Perspective (Palgrave Macmillan, 2008) and co-editor of Prison Readings with Yvonne Jewkes (Willan, 2006).